Amarillo’s newest sports and entertainment venue is getting a big break from a most unpredictable source. That would be Mother Nature. Whatever. The crews have dug out a huge hole in the ground across the street from City Hall. Site preparation is proceeding rapidly. I suspect that quite soon we’re going to start seeing crews laying down the components that will go into the MPEV’s foundation. After that, the framing will commence. And on and on it will go. The MPEV is projected to cost around $45 million. It will seat roughly 4,500 seats for baseball, which will begin there in April 2019 when the AA minor-league baseball team moves from San Antonio to Amarillo. I don’t want to spook the project, given the good meteorological fortune that has foreshadowed it to date, but we do have the rest of the spring and summer coming up and then the winter of 2018-19. As dry and relatively calm as the winter of 2017-18 turned out to be, there can be no way to predict this far out what the next winter will bring. We all know the quips and jokes about the fickle Amarillo and Texas Panhandle weather, yes? 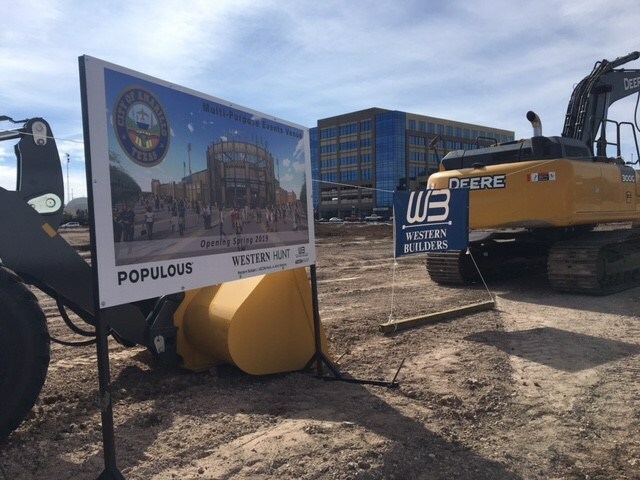 My faith in what the MPEV will bring to downtown Amarillo remains strong. It will play a huge role — perhaps the major role — in reshaping the city’s central business and entertainment district. To date, I am gratified and hopeful that the construction crews will be able to proceed quickly and, of course, efficiently as it moved toward completion of this important project. Gratitude and hope, though, cannot predict what Mother Nature has in store. As inclined as I am to pray for rain to help our beleaguered farmers and ranchers, I am torn because I don’t want the MPEV stalled because of torrents. Previous PostPuppy Tales, Part 49Next PostSatan 2 rocket? Aimed at U.S.?